I make these roasted potatoes all year long. I’m going with “Choose your own adventure” from now one, because that’s how I make them. Whatever’s on hand and whatever cooking method is suitable for the season. 1 pound of poatoes scrubbed and cubed, today I’m usuing teeny-tiny potatoes from Trader Joes, which are the size of my thumb. 1 tablespoon mixed dried herbs. Rosmary, marjoram, tyme, tarrgon, crushed red pepper pretty much anything goes. In a small bowl or even a coffee mug, use a fork to whisk together the oil, garlic, dried herbs, salt and peper. 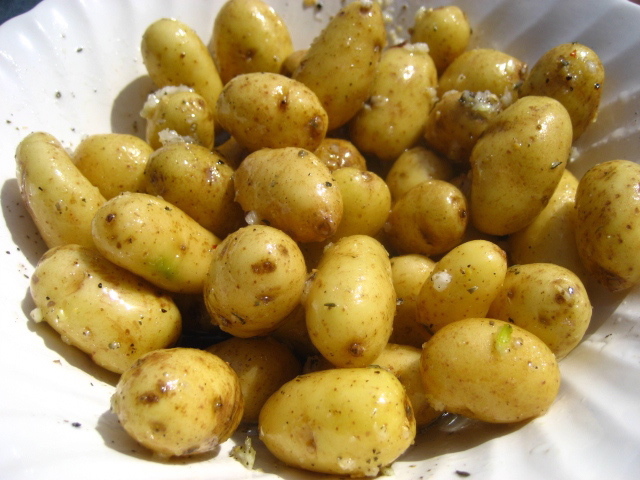 Place cubed potatoes in a large bowl or large zip top bag and oil herb mixture. Toss to coat. Let them sit for as long as you can to marinate. Sometimes if I plan well they sit over night and are amazing. Cook them following cooking instructions below. Poke them with a form to make sure they are done enough. Oven: Bake a 375 degrees in any baking dish for about an hour. Turning potatoes frequently. They can always go longer and will get crispier. BBQ: Place in a foil pan in a foil packet on the grill, turning potatoes frequently or flipping packet over for about an hour.